It's no secret that I love pasta. I love making lasagna, but it takes sooooo long. I found this cute and less messy alternative and wanted to share it with you. Trim 12 of your lasagna pieces into 6" strips and place on a lightly oiled cookie sheet. Cut your remaining 4 pieces into three equal sections and place on sheet pan. Brush a 12 cup cupcake tin with olive oil. Lay two of the 6" lasagna strips in the bottom of each mold to form an "X". The strips will hang over the sides. Now sprinkle about 1 1/2 tbsp. of each type of cheese over the pasta, making sure to pack it down well. Top with 1 tbsp. of your white sauce. 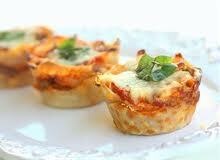 Then place one of your smaller lasagna pieces on top. Repeat this until all of your molds are done. Finally, fold the two overhanging pieces (from when you made your "X") over the top of each cupcake, using sauce to seal the edges. Place a small amount of sauce on top of each and sprinkle with cheese. Cover with plastic wrap and let chill in the refrigerator for at least two hours. When they're ready to go, preheat your oven to 325 degrees, baking cupcakes for 25 to 30 minutes. Let the cupcakes rest about 10 minutes before serving. Melt 4 tbsp. butter in a saucepan over medium heat. Add 3 tbsp. flour and stir for 2 minutes. Add 2 cups of hot milk, slowly, and making sure to stir constantly. Add a pinch of salt and cook over low heat, stirring until thickened. It will take about 10 minutes. •Exchange your alfredo for a marinara sauce. •Try provolone, monterey jack or a smoked mozzarella for a different flavor. •Add a sprinkle of feta cheese for a tangy boost. •Place a tbsp. of ground beef or diced chicken inside the cups. Oh you've got to try them! They're SO good!